In the lower section of the painting you can see the stone or marble bust of a man, forehead partially bare, sporting strange glasses without arms, the lenses of which look like two holes of nothingness in the skull, concealing a blind gaze. At his side, seemly floating in space, there’s a stele with two symbols, a conch shell and a fish. Behind, or more specifically above him, embraced by light, you can see the side profile of Guillaume Apollinaire plunged in the shadows. A circle with a fine white line that looks like a target has been drawn on his temple. Another smaller one has been drawn on his clavicle like a nail piercing his shoulder and there is another, finer line at the crux of the arm. The whole scene is bathed in shadowy brown and green tones, lit only from the right. 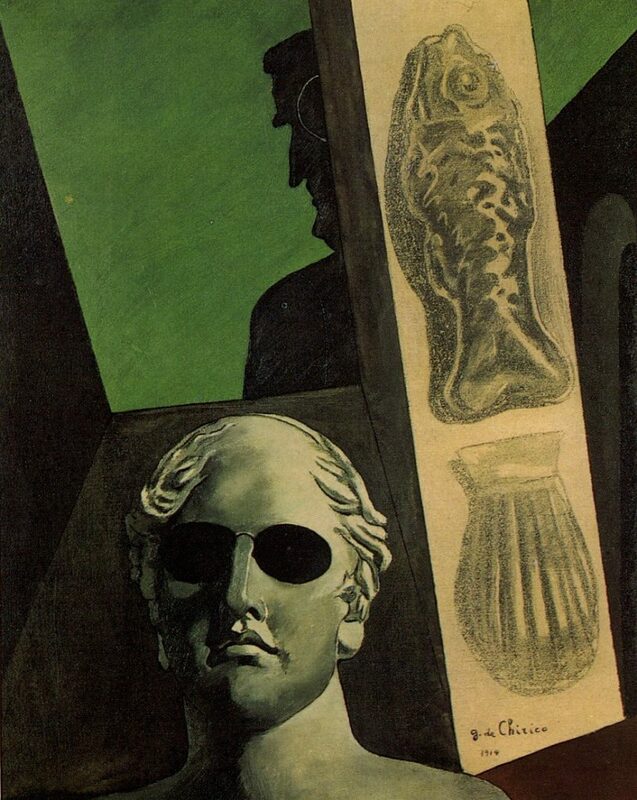 Painted in 1914 by Giorgio de Chirico, this is one of the first Surrealist paintings – a word that didn’t exist when the piece of work was painted – and with good reason because it was actually Guillaume Apollinaire who coined the term three years later. The whole piece is packed with enigma. By juxtaposing several shots in an improbable perspective – just as in a dream when disparate elements find themselves superimposed in an odd way – the painter proposes multiple readings, in which mythological references to Orpheus (suggested by his attributes – the conch shell and the fish) are combined with blind fortune-teller Tiresias (possibly the bust in the foreground). But the richness of this painting resides mainly in its story. Target man – the initial title of this painting – was given by Chirico to his friend Apollinaire, who was one of his first and most fervent supporters. But look what happened: in 1916, the poet was sent to the front in WW1 and received a shrapnel wound to the temple. Exactly where the painted had drawn the target! The legend was born: Chirico had foreseen the drama that lay ahead; the visionary artist had anticipated the fate of the poet. This would soon be dubbed objective chance. Target man then became the Premonitory portrait of Guillaume Apollinaire.